The U.S. military began testing on an electric ray gun defense weapon that may potentially provide a new level of protection for combat troops in overseas war zones deactivating enemy weapons on the battlefield. The “Burke Pulser”, named after its developer James E. Burke, is an attachment that will snap onto the M4 rifle, and is able to emit a powerful, targeted blast of electricity capable of frying the electric circuits of roadside bombs and IEDs. This application is of particular interest to the military after years of operating in the Middle East, where booby-traps and homemade roadside bombs have caused the most non-fatal injuries of any conflict that America has been involved in. While other systems, like the truck-mounted HEL-MD lasers, are being built to fry incoming aerial threats like drones and missiles, the Pulser is meant to instead obliterate the electrical circuitry of roadside bombs and IEDs. The Burke Pulser attaches to a soldier’s weapon as conveniently as a flash suppressor. Furthermore, compared to other weapons that have been tested in the past, the Pulser is remarkably cost-effective, at a price tag under $1000. That’s a heck of a lot cheaper (in both money and manpower) than sending in an EOD (bomb disposal) squad. The Pulser converts the explosive energy of the gun into electrical energy using a piezoelectric generator and two protruding antennas to generate powerful bursts of electrical charge. 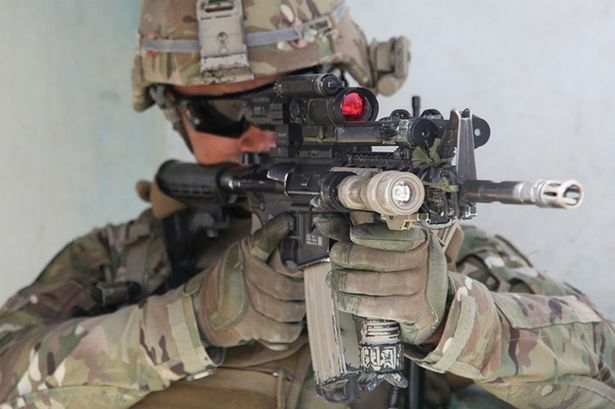 The entire unit fits onto the end of the Army’s M4 carbine just as a standard-issue flash suppressor does. Because of the vast amounts of electricity that will be generated by the weapon, the Pulser also has a built-in shield to protect the operator.